Not going to see Pittsburgh Batman is one of my biggest regrets of 2013. Pittsburgh Batman is a play that was performed last year at Bricolage Theater. 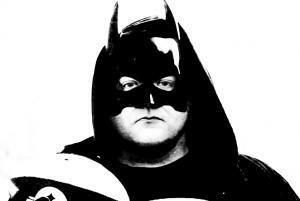 Back by popular demand, Pittsburgh Batman will be at the Kelly Strayhorn Theater this weekend. There are only 3 performances and I’m sure this will be a sell out again. Pittsburgh Batman is the brain child of Lord Grunge and Jackson who hail from Pittsburgh, but are often traveling as the dou Grand Buffet. I have the good fortune of getting to know some of the other cast members, who are incredible performers and some of the most creative people in Pittsburgh). Post-Gazette – ‘Pittsburgh Batman’ at Bricolage: Who is that masked man? Tickets are $25.00 and available online here. Follow @PittsburghBTMN on Twitter for updates.